Catherine, Duchess of Cambridge (aka Kate Middleton) and her husband Prince William were the biggest stars of them all at the 2018 EE British Academy Film Awards held at Royal Albert Hall on Sunday in London, England. While all the attendees were encouraged to wear black as a stand against sexual assault, harassment and inequality in the entertainment industry, the 36-year-old pregnant royal chose a dark green dress from Jenny Packham. Like all other members of the royal family, she is supposed to remain strictly neutral with respect to any political campaign or movement. Royals are only supposed to wear black when attending a funeral or Remembrance Day. Catherine styled her off-the-shoulder Jenny Packham dress with pointy-toe Prada wavy cutout pumps and a vintage velvet bow clutch designed by Jaime Mascaro from Pretty Ballerinas. While it has not been confirmed, it’s rumored that she wore a black sash with the dress in support of the Time’s Up movement. Do you think Kate would have faced repercussions if she had worn black? 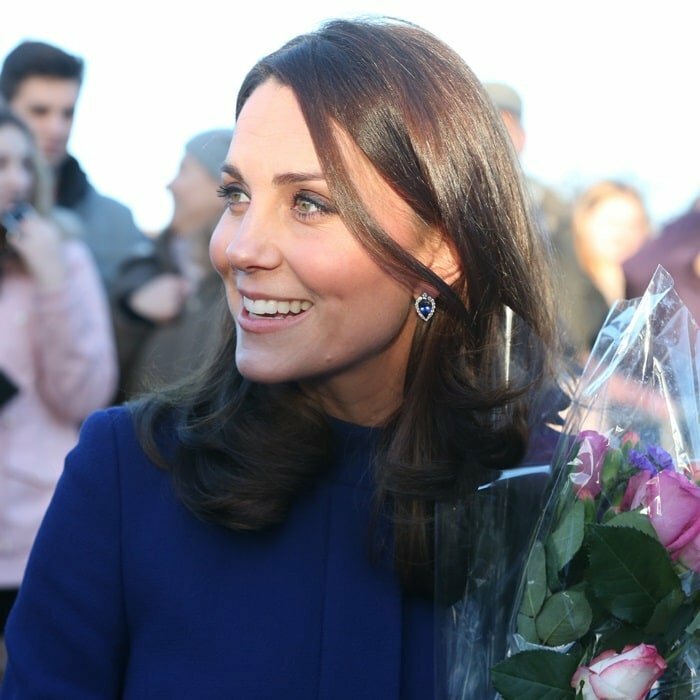 Earlier this month, Kate also attended the opening of the Action On Addiction Community Treatment Centre in Wickford, England. She greeted her fans in a blue Goat coat styled with a limited edition ‘Blue Heart’ clutch in black croc and her favorite ‘Power’ pumps from Stuart Weitzman. Once again, the unlucky royal got her heels stuck in the grill. A few years ago, she experienced the same shoe mishap during a St. Patrick’s day parade.